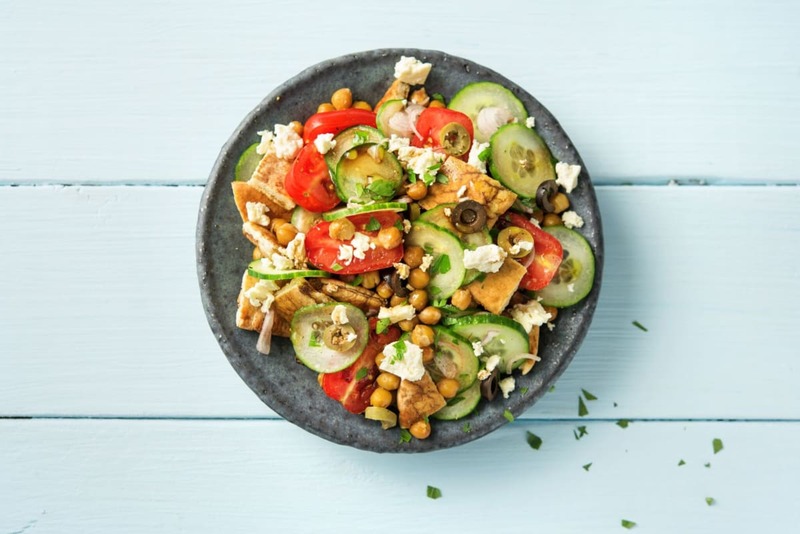 Fattoush is a Middle Eastern version of the Italian panzanella, a hearty “salad” bulked up with equal parts bread and veggies. In this recipe, toasted pita meets crisp cucumbers meets tangy feta meets a fragrant garlic oil. The result? A salad with major flavor. Wash and dry all produce. Preheat oven to 425 degrees. Thinly slice olives. Thinly slice cucumbers. Halve grape tomatoes. Halve, peel, and thinly slice shallot. Thinly slice garlic. Pick parsley leaves from stems. Discard stems. Drain and rinse chickpeas. 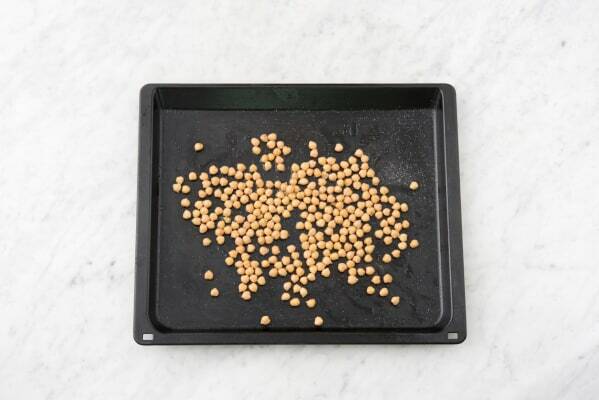 Toss chickpeas on a baking sheet with cumin, a drizzle of olive oil, and a pinch of salt and pepper. Bake until crispy, about 20 minutes. Make the vinaigrette: Heat 2 Tablespoons olive oil in a small pan over medium heat. Add garlic. Cook until slightly brown and fragrant, 1-2 minutes. Discard garlic, and remove pan from heat. Once cooled, thoroughly whisk in vinegar and season with salt and pepper. 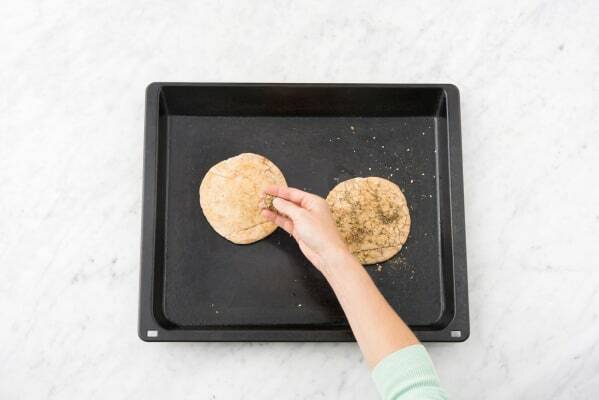 Drizzle each pita with olive oil, sprinkle with za’atar, and season with salt and pepper. 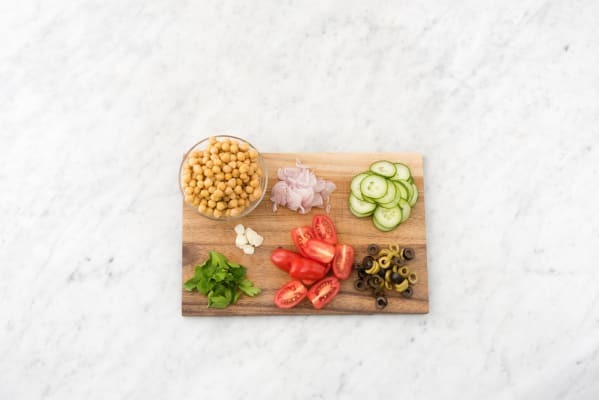 Place pitas on baking sheet with chickpeas. Toast until crispy, 6-8 minutes. Cube the pitas: Cut pitas into 1-inch cubes, and place in a large bowl. Let chickpeas cool slightly, then add to bowl with pitas. Add cucumbers, olives, tomatoes, parsley leaves, and as much shallot as you like. Add vinaigrette, and toss to thoroughly coat. (TIP: Start with half the vinaigrette and go up from there.) If fattoush salad is dry, add more olive oil. Season generously with salt and pepper. 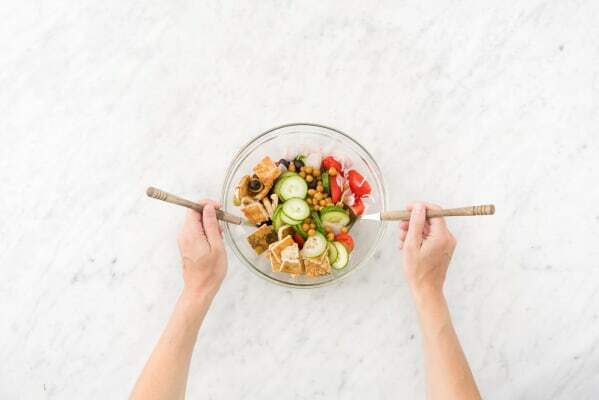 Divide between bowls, sprinkle with feta cheese, and enjoy!